On run no. 9 I actually ran with someone else! I had met the guy’s wife a few times and she mentioned that her husband was a runner (well they are both super-sporty, running marathons, cycling holidays, etc.). Anyway, her husband emailed me and invited me to go on a 5 mile training run with him. It turned out he was a top bloke and we had a good run and some great conversation – then he even offered me breakfast. All in all the perfect start to a day! What made the run even more interesting is that he is a barefoot runner. This was something I had never even heard of. He explained the theory to me, in that running barefoot forces you to adopt a gait that is much less hard on the joints and is more natural. He told me that had adopted this as a means of avoiding injury, as he is a high miler and not of a lithe, lanky build. Contrary to what I expected, he didn’t actually run barefoot. He wore a pair of sort of flip-flops. They were a training shoe sole, but without the cushioning and fitted with a toe-bar and an ankle strap. He explained that these prevent abrasion when running on hard surfaces, and protects against cuts, from glass, sharp stones etc. 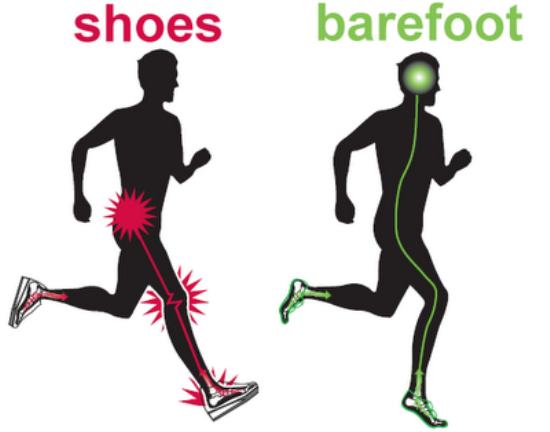 but maintain the barefoot experience and the running style. The soles being very thin you feel every sharp stone, every slight unevenness of surface. This meant we had very different running styles. He was much more sensitive to the ground over which he was running, he would have to slow down and carefully pick his way over stony places, he was always on the lookout for potential dangers, glass, nails, etc (as the sides of your feet and toes are still quite exposed). In contrast, I blithely blundered on, not looking where I was going, not conscious of the nature of the ground over which I was running. Which provoked an odd spiritual reflection. I have read quite a lot of hagiography – the lives of the saints – and one thing you notice is that the more holy people are, the more sensitive they are to sin. They feel the pain and the weight of their own sin, they understand the horror of what sin is, as it drives a wedge between themselves and the God they love, they see its capacity for harm in lives and relationships. Consequently, they are always on the lookout for it, they fear it, they do everything in their power to avoid it, they are constantly scanning the path ahead for dangers and snares. Whereas numpties like me blithely blunder on, with nary a care and soon find myself bang in trouble. I have no real desire to take up barefoot running – although I may consider it should ever injury strike – but I’m hopeful my modest distances (9 miles a week) and the regular purchase of good running shoes, will aviod this. However, in my runningwithgod I think that I need to adopt more of a barefoot strategy. How I can do this, is through connection. Connecting with God in His word – studied privately and explained to me at church. Connecting with God in prayer – as this attunes my spirit to His Spirit. Connecting to those holier than I, whose lives will act as a challenge, an encouragement, an exhortation and a rebuke to me.